GOLD WINNER OF THE JUNIOR DESIGN AWARDS BEST BABY BOOKS 0-2 YEARS. The Big Steps series is designed to help little ones cope with everyday experiences in their lives. In No More Nappies, meet Millie and Mo - two adorable toddlers who are ready to ditch their nappies and learn how to use the potty. Follow the ups and downs of their potty-training journey brought to life with fun flaps and mechanisms. Each page has really helpful potty-training tips for parents and carers that are endorsed by leading Early Years Consultant, Dr Amanda Gummer. With delightful illustrations from Marion Cocklico, No More Nappies is a brilliant way to introduce potty training in a fun and relatable way. For more toddler tips read I'm Not Sleepy: Helping Toddlers Go To Sleep. Marion Cocklico studied graphic design at Pivaut (Nantes) for 4 years before becoming an illustrator. She's worked with over thirty different French publishing houses since 2008 including Gallimard Tourbillon and Larousse. She lives in Paris. 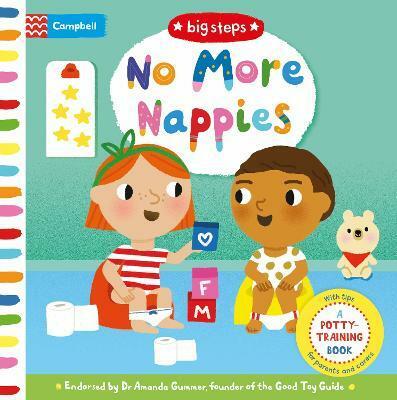 The Big Steps series, including No More Nappies and I'm Starting Nursery, are Marion's first titles for an English publisher. Dr Amanda Gummer is a research psychologist specialising in child development, with over 20 years experience working with children and families. She has set up three organisations - Fundamentally Children, FUNdamentals and the Good Toy Guide Ltd - all of which promote the value of play and positive parenting in child development. Amanda is frequently in the media and on expert panels for child-related issues, as well as being the British Toy and Hobby Association's spokesperson for their Make Time to Play Campaign.